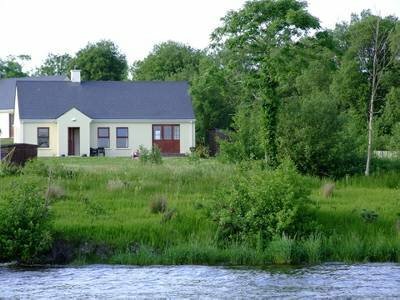 The property is in a premium position on the tranquil shore of Lough Erne it is suitable for families, couples or special interest parties. It is 1200sqft approx with all modern conveniences. There are 3 separate bedrooms. One twin room, one set of bunks and the master bedroom has an ensuite bathroom, sleeps 6. The main bathroom has a separate shower and bath. Misty Moorings has its own private jetty plus outdoor dining facilities overlooking the Lough and is equipped with a sturdy Weber Barbeque for cooking Al Fresco. Free WI FI Internet connection provided. • Water sports - Canoe hire, water skiing lessons, Kayaking, Wake Boarding, Knee Boarding and Inflatable Rides ( Banana Boating etc). available locally. • Golf : Lisnarick 18 hole par 66 and floodlit Driving range. Manor house 9 hole. Castle Hume 18 hole par 72 . Full clubhouse facilities. Enniskillen 18 hole par 71. • Tennis Courts for hire are available in Irvinestown and Manor House. • Fishing - Coarse and game fishing throughout the Lough. Local gullies available for private hire. • Pony Trekking through nearby Castle Archdale forest. • Flying – see Lough Erne from the air - trial flying lesson available at St Angelo airport. • Unique Seaplane trips over Lough Erne in modern Amphibious Aircraft. • Clay pigeon shooting and Archery. • 4X4 off road driving. Experience a Safari Drive and drive on adverse off road conditions. • Go Karting - 550m outdoor karting track near Kesh. Races are fully marshalled karting gear provided . • Devenish Island with ancient round tower is one of the finest monastic sites in Ireland. • Castle Archdale Forest Park - Nature trails, Lough side and woodland walks and cycle trails run throughout this beautiful country park which is located on the shores of lower Lough Erne. Visitors can the explore a butterfly garden, wildflower meadow and deer enclosure. Woodland & loughshore walks. Marina, access to White Island, natural history exhibits, old agricultural history exhibits, old agricultural machinery. Castle Archdale at War exhibition on the Battle of the Atlantic. Archdale Centre, corner of the main courtyard. See various exhibitions, including ‘Castle Archdale at War’. The exhibition highlights Castle Archdale’s important role in WW2 as the most westerly flying-boat station, from which aircraft protected the allied convoys from the U-boat threat in the North Atlantic. • Historic town of Enniskillen. • Atlantic Ocean at Rossnowlagh beach. • Lough Navar Forest Park view point for panoramic views over Co Fermanagh. Sligo, Benbulben and Yeats country is 40 mins by car. • Founded in the 6th Century by St. Molaise, Devenish Island is in Lower Lough Erne and is one of the finest monastic sites in Ireland. • Cruises of Lower Lough daily from Enniskillen. • Lunch cruises available onboard the fully air conditioned Lady of The Lake. • Enniskillen - Donegal Town and Omagh are only a few of the places to enjoy a varied shopping experience. • Try the famous Fermanagh Black Bacon locally made by O Doherty Butcher Enniskillen. • Try the locally made Tickety Moo ice-cream at Oghill farm, Killadeas. • Spa - Full & Half Day Thai Spa Packages at Lough Erne Golf Hotel also have complimentary use of The Infinity Pool & Thermal Suite at The Thai Spa. • Ulster American folk park Omagh. • Sheelin Antique Lace Museum Bellanaleck.